after seeing so many people struggle with understanding the differences between the Design-Build system of project delivery versus the traditional system. 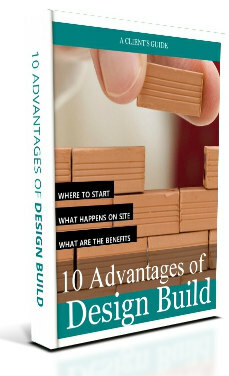 Design-Build has many advantages over the traditional system where an owner himself hires an architect for design, engineers for technical trades, interior designers and a builder for construction. – Architect-lead concurrent design and estimating from beginning to end. – Specialized experience in custom residential solutions. Bob only works on homes. It really is personal for us. Everything we do revolves around you, the client—your goals, preferences, lifestyle and budget. We work surpass your expectations. Ask our past customers! For us, being accountable encompasses many things: Bob engages in relentless continuing education updating his design and construction knowledge so he can deliver his promises as a multiply licensed specialist professional: licensed architect, licensed contractor, certified Passive Home Consultant, Certified Passive House Builder. Bob personally manages his projects on-site almost daily and is accountable for everything that happens on your project from communications, budget, daily building and schedule through to the finished product as well as after occupancy. Again – ask our past customers. Accountable means Sole-Source-Responsibility as well as mindful sustainability: low-carbon Living (low-energy to zero-energy), designing for comfort (deliciously warm in winter, cool in summer), designing for “resilience” (mitigating oncoming Climate Change including water conservation strategies) and Universal Design (common sense aging in place with grace). You deserve to enjoy a healthy, easy-on-the-planet nest. It will have all the qualities, amenities, style, and sustainability as you desire. Remarkable because your custom home reflects you, your needs and dreams and your lifestyle. © 2015 Kreger Design Build, LLC. All rights reserved.